Jonathon Porritt CBE delivered the 31st Annual Campden lecture, addressing Sustainability through Food Security What are the challenges that face industry and Government as a result of agreed targets for the reduction in greenhouse gas emissions? In a provocative critique of current Government policy, environmentalist Jonathon Porritt takes us through the major factors that will affect food production, explains why he believes that Government Policy on this is not fit for purpose, and argues that sustainability and food security are inextricabily linked. He also spells out the challenges that lie before the food and drink supply chain, as companies will be required to cut emissions in response to agreed national targets. What a time - and privilege - to be giving the 31st Annual Campden Lecture. Indeed, I wonder if there has ever been a time of greater uncertainty - and potentially radical discontinuities - since the first Lecture in 1979? I'm sure that most policy-makers today sincerely hope that this is not the case. Policy-makers abhor radical discontinuities. For policy-makers in Defra, it's the unforeseeable radical discontinuities (such as Foot and Mouth) that cause most disruption. This Lecture, however, is about wholly foreseeable radical discontinuities, which should at least be more amenable to appropriate policy shift. When the writing about such discontinuities is incontrovertibly on the wall - to the extent that all but the illiterate can read it - it makes little sense to persist with policies that ignore the new script. But that, I fear, is what's happening. Supportive though the Sustainable Development Commission has been of the current Sustainable Farming and Food Strategy, as we were of Sir Don Curry's Commission that led to the Strategy, I've come to the conclusion that it is no longer fit for purpose. My reasons for coming to that uncomfortable conclusion are born partly of policy changes already made elsewhere in government, and partly of the growing scientific consensus that conventional food and farming policies are taking us into "A Perfect Storm" (to use the Chief Scientific Advisor's somewhat sensationalist language!) unless we make some radical shifts in anticipation of the radical discontinuities ahead. I want to start by looking at just two of these. Last year, the Climate Change Act passed into Statute - with the full support of the opposition parties. A few weeks ago, the Government announced the statutory targets against which the UK's "carbon budgets" will now be assessed: at least a 34% cut in greenhouse gases by 2020 (rising to 40% if a deal is done in Copenhagen at the end of the year), on the way to an 80% cut by 2050. We are simultaneously committed to ensuring that 15% of all the energy we use by 2020 (that covers electricity, heat and transport) will come from renewables. Apart from the Treasury (which remains largely disconnected from the true implications of this climate strand of Government policy), there are three departments which will have to transform their entire rationale to become anything other than an irreconcilable barrier to delivering on those targets: BERR (obviously), DfT (even more obviously! ), - and Defra. [Note: BERR activities are now part of the Department for Business, Innovation and Skills]. You will all know the figures here. The UK food sector's contribution to total greenhouse gas emissions has been estimated at around 19%. Of that, UK agriculture contributes around 50% (i.e. 9% of total emissions), the lion's share coming not from CO2 but from nitrous oxide (mostly from the 1 million tonnes of artificial nitrogen fertiliser we use every year) and methane (contributing 37% of all UK methane emissions). Food and farming is both a big contributor to climate change, and will (as we'll see) be massively impacted by it. And the prospect of effectively mitigating those impacts gets more daunting by the year. There may still be some here who question whether the reality of climate change is quite as certain and as urgent as people like me make it out to be. I'm afraid there is no comfort to be had in that particular optout - unless, of course, you think that Jeremy Clarkson and the Daily Mail are better authorities on climate change than the Government's Chief Scientific Advisor and the overwhelming majority of serious scientists today. Indeed, that scientific consensus is now moving in an even more radical direction, indicating that the 2007 Report of the Inter-governmental Panel on Climate Change (on which governments the world over have based their policy-making) has significantly underestimated both the speed and seriousness of climate change. The principal reason for this is because the IPCC was not able to factor into its consensus the likely consequences of natural feedback loops: those bits of the global climate system that are impacted by the anthropogenic warming that we've put into the system over the last hundred years or so. If I mention one or two of these potential feedback loops (or "canaries in the climate mine", as some describe them), you'll see why this keeps so many climate scientists awake at night: accelerated disappearance of the Arctic sea ice; accelerated melting of the Greenland ice caps; more pronounced stresses in the Antarctic ice sheets; accelerated melting of the permafrost in Siberia; growing acidification of the oceans; the threat of accelerated die-back in the Amazon rainforests; slower take-up of CO2 by the oceans - and I could go on. In that context, the 34% target by 2020 (which already sounds almost impossibly ambitious) will, I believe, be judged over the course of the next five years or so to be wholly inadequate. I mentioned two radical discontinuities that I wanted to look at. The second is obesity. Both the Foresight's 2007 Report on Obesity, and the Cabinet Office's 2008 "Food Matters" Report demonstrated just how serious a policy challenge this has now become. This is currently reflected in a host of Department of Health strategies and Action Plans. Four of the leading causes of death in the UK (heart disease, strokes,Type 2 diabetes and cancer) are all intricately linked to poor diets, particularly excess salt, fat, sugar and calories. Food-related ill-health costs the NHS an estimated £7.7 billion in 2007, 9% of its total budget. An estimated 70,000 premature deaths in the UK could be prevented each year if UK diets matched official UK nutritional guidelines - with the health benefits amounting to nearly £20 billion annually in quality-adjusted life-years. The UK already has the highest rate of childhood obesity in the EU. That's today. The Foresight Report predicted 40% of UK citizens will be obese by 2025, and 60% by 2050. "There is no obvious joined-up thinking in linking national dietary guidelines to enabling farmers to produce more of the key food groups at affordable prices that would improve peoples' health and cut costs of the NHS. Such a shift would reduce demand for and production of meat, eggs, sugar, fats and diary products and encourage increased demand for a wider range of cereals for direct consumption, more root crops, more fresh fruit and vegetables - whilst still supporting consumption of less, more extensively-reared meat." "Lard Help Us: Fatties' Girth wrecking Earth"! "We believe that global food security means everyone having enough to eat, in a way that does not compromise future generations' ability to feed themselves sustainably and healthily." Perhaps you detect a note of anger? Well, yes. There is literally no excuse for Defra still being so far off the pace. Before returning to the implications of this, let me just round out, in brief, ten further reasons why we should tear up our Sustainable Farming and Food Strategy and start all over again. All of these have both a global and a UK-specific dimension. of energy prices rising again just as soon as levels of economic activity pick up again - particularly in China and India. As far as I can tell, there are no serious commentators who think that oil will ever go below $40 again, and most are projecting a price range of between $60 and $110 by the middle of 2010. Even the oil companies now acknowledge that the days of "easy oil" are gone forever, removing the foundation stone on which the whole of modern food production has been built. Without cheap oil and cheap gas, there is no more cheap food, and the sooner we recognise that non-negotiable reality, the easier it will be to adapt policy accordingly. Few people really understand the extent of our near-total dependency on fossil fuels - in terms of fertilisers, pesticides, herbicides, farm machinery, storage, supply chains, retail systems and so on. As many commentators have pointed out, we are basically "eating oil", and on an almost inconceivably inefficient basis. At least 7.5 calories are used by the US food system to deliver each calorie of food energy - and although farming itself accounts for only 20% of this, it still consumes a lot more energy than it delivers. Here in the UK, we need no reminding of the potentially devastating impact of some cut-off in supplies of fuel due to "events beyond our control" - as politicians like to describe them. The fuel tax protests in 2000 not only brought to an end the Government's fragile commitment to the principles of Ecological Tax Reform, but highlighted the vulnerability of our energy-intensive processing, packaging, distribution and retail systems. We weren't that far away from empty shelves in our own supermarkets. Most synthetic nitrogen fertiliser is manufactured with natural gas. Although its use in the rich world peaked in the late 1980s, demand continues to grow in the developing and emerging economies. Fertiliser prices spiked in line with oil at $147, reminding us that the end of cheap oil means the end of (relatively) cheap fertilisers. An end to cheap fertilizers means dramatic changes for all farmers the world over. High prices will hit poorer farmers hardest as they struggle to get their hands on the kind of petrochemical inputs that they've been trained to depend on. This need not be the case. As the International Assessment of Agricultural Knowledge, Science and Technology for Development (IAASTD) pointed out last year, there are plenty of opportunities to improve agricultural productivity in poorer countries without exacerbating dependency on artificial inputs. This has been confirmed by UNEP's 2008 Report on "Organic Agriculture and Food Security in Africa". In rich world economies, farmers are going to have to rediscover the delights of nitrogen-fixing cover cropping, nutrient recycling, green manures and more sophisticated crop rotations. This isn't going backwards, as some would have you believe, but simply learning to thrive in a world where we do not seek to prove how clever we are by ignoring the laws of thermodynamics. Every year, we import around 200,000 tonnes of phosphate rock from Morocco,Tunisia, Algeria and Egypt - mined from finite reserves. Again, estimates vary as to the future availability of phosphates (from anywhere between 20-100 years), but farmers are now much more focussed on price as the best indicator of future availability - especially as demand in China and India is soaring. Almost all the herbicides, insecticides and fungicides that modern farming depends on are based on access to cheap fossil fuels. For sound precautionary and economic reasons, farmers have been getting smarter and smarter in their use of chemicals, a trend which will need to be accelerated as the age of cheap oil comes to an end. This is barely recognised in Defra's food security paper. Agriculture accounts for more than 70% of fresh water use. In many parts of the world, water stress and water scarcity are the biggest threats to food supplies that countries are facing. Agriculture in Australia is in terminal crisis (some argue that it was the drought-induced, climate-induced collapse in its rice crop that drove rice prices sky high across South-East Asia, with dramatic effects on the lives of hundreds of millions of the world's poorest people). Agriculture in China may well be in an even worse position than Australia, and even California is now at risk as it has never been before - as Steve Chu, Obama's new Energy Secretary, has pointed out in a devastating critique of the way in which climate change will make life all but impossible for California's farmers and growers over the next couple of decades. And then what happens? There are more of us every year (roughly 70 million), and more of us are moving to more processed, carbon-intensive, meat-intensive, water-intensive diets every year. At the same time, there is less and less land available every year, and even the most zealous of today's cornucopians acknowledge that the "technology pipeline" that we have depended on to help increase yields is looking a lot less substantive than they would like. In this regard, there's just one book I would recommend, namely the latest from Paul Roberts: "The End of Food:The Coming Crisis in the World Food Industry". It maps out the absurdity of having allowed ourselves to get caught on a "technology treadmill" that clearly can't go on delivering the goods in terms of increased yields - not least because that same treadmill has been inflicting serious damage on the life-support systems on which we depend. This isn't the time to go into a detailed account of the biofuels debate. But whichever way it goes, even if one posits a series of incredibly successful, more-or-less sustainable "second-generation" biofuel breakthroughs, the impact on land availability can, at best, be neutral. And it's going to be a tough call to achieve breakthroughs of that kind. In December last year, the South Korean firm, Daewoo, made the news when it secured a 99 year lease on 1.3 million hectares in Madagascar to grow maize and oil palm - for the sole purpose of export to South Korea. China has been investing heavily in Africa and Sri Lanka for quite some time (to the tune of more than 2 million hectares of foreign farmland since 2007); Saudi Arabia has been investing in Thailand, Libya and the Ukraine, and even Sweden is getting in on the act. NGOs describe this as blatant neo-colonialism, especially when the land is designated for biofuels rather than food production. Security analysts see access to land becoming as vital a national security issue as access to oil, gas and coal. Against such a backdrop, it just seems very naïve to talk about global supply chains looking more or less the same in ten years time as they do today. Agriculture contributes to climate change not just through the emissions of greenhouse gases from farming itself, but from soil degradation, releasing carbon once sequestered in the soil. UNEP estimates that nearly 2 billion hectares of land are affected by human-induced erosion and soil degradation, and in its 2002 "State of World Soils" report, provided the shocking insight that if we continue on a business-as-usual basis, nearly half the world's current arable land will be "unusable" by 2050. Farmers the world over will need to move rapidly and systematically to regenerative fertility-building systems that build humus and retain carbon in the soils. Here in the UK, Defra estimates that 10 billion tonnes of carbon are stored in UK soils. It's been estimated that our soils are now losing carbon at around 13 million tonnes annually, which is pretty much as much as is emitted by UK agriculture from all other sources. In 2008, the Royal Agricultural Society of England expressed deep concern about the weakened state of UK soil science, although it has to be said that both Wales and Scotland are much more focussed on this than would appear to be the case in England. Whilst livestock farmers prepare for bluetongue or wait anxiously to hear about the origins of swine flu, wheat farmers the world over are tracking the progress of uG99, a virulent strain of black rust fungus discovered in Uganda in 1999. Since then, it has spread east across Africa into The Yemen and scientists believe there is now little to stop its spores blowing on into Egypt,Turkey and India. Almost no wheat crops anywhere in the world are any longer resistant to uG99. Crop and livestock scientists make no bones about the vulnerability of modern intensive farming systems (based as they are on monocultures and factory farms), to diseases and pathogens both new and old. And many now believe that accelerating climate change can only exacerbate those vulnerabilities. I think I need hardly labour this point - having been accused of every heinous, neo-Malthusian crime in the book after suggesting that the responsible thing for all parents in the rich world would be to have no more than two children! That position is based on the wholly logical conclusion that every single one of the points above will be a lot harder to address as a consequence of there being 9 billion people on this planet by 2050 rather than (say) 8.25 billion - which is the point at which we could stabilise human numbers if we got serious right now about improving the lives of hundreds of millions of women across the world who need better education for their children (particularly their female children), better healthcare (particularly reproductive healthcare), and improved access to a choice of contraception without coercion or oppression (particularly by men and religious leaders). Bottom line here: no renewable, genuinely sustainable food system can support an ever-expanding and more resource-intensive population. I continue to challenge anyone to refute that logic - whatever you may think about Thomas Malthus! Ten critical factors, with a massive impact on food security here in the UK. To cover that extensive terrain, I've had to address each of these as if they were stand-alone phenomena, capable of just the right combination of targeted policy responses. But they are not. Nor is climate change. Nor is obesity for that matter. They are all aspects of complex, interconnected systems, influencing and being influenced by every other aspect in that system. We're back to feedback loops. That's what John Beddington was pointing to when he talked of his "Perfect Storm": the way in which the synergistic interactions between all these things create uncertainties and pressures that no amount of "too little, too late" panic-driven policy-making can possibly manage. "National food security is hugely more relevant for developing countries than the rich countries of Western Europe. The UK is well-placed to access sufficient foodstuffs through a well-functioning world market." Defra (author of those words) continues to argue (alongside all the big food retailers as well as the NFU) that the UK's food security is best served by ever deeper integration into international supply chains. But does that really make sense in such a fractured and uncertain world? There is considerable controversy even surrounding the basis on which food security should be measured. Food production in the UK was at its low point in 1939, when around one third of food consumed came from UK farms. This had doubled by the end of World War 2. The high point of UK food production was reached in the early 1980s. Home-grown production has steadily declined since then. Today, the proportion of all food which comes from the UK is just above 60%, and for indigenous food (which can be grown in the UK) around 74%. Defra is of course right to describe "absolute self-sufficiency" as "an illusion" - what would we do without our tea and coffee, or our oranges and bananas? But we need to get beyond the simplistic percentages. We need to recognise the distinctions between self-sufficiency and optimised, sustainable self-reliance. It's that which allowed Hilary Benn to say at the 2009 Oxford Farming Conference that "I want British agriculture to produce as much food as possible. No ifs. No buts." And that means we must step back and look at the fundamental principles which underpin any serious approach to food security. Both our production systems here in the UK, and our supply chains globally, are seriously vulnerable in the face of the radical discontinuities laid out above - and you will notice how forebearing I have been in not even mentioning the word terrorism! Policy frameworks are best designed on the basis of "worst-case eventualities", rather than "best-case improbabilities". 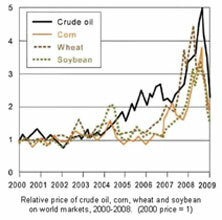 The Sustainable Development Commission first drew attention to this in its report in 2007, "$100 a Barrel of Oil: Impacts on the Sustainability of Food Supply in the UK". This came out well before oil went not just to $100 but to $147, but attracted very little interest from Defra at that time. This was frustrating, all the more so as the principle of resilience would appear to be precisely the basis on which Defra is adopting biosecurity and disease control. The second principle will be a much less familiar concept: namely RESOLARIZATION. Let's just spell this out: the only way to avert a sequence of food crises resulting from supply disruptions and price spikes in oil and gas over the next 20 years is to systematically reduce our dependency on stored solar energy (i.e. fossil fuels) in favour of real-time solar energy. Such a transition will sound scary, but at the risk of stating the obvious, this decoupling is of course inevitable over the long term, with or without climate change, as finite resources of oil and gas are worked out. 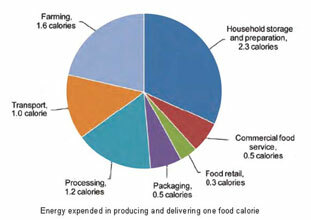 Getting one calorie of food energy out for every five, six or seven calories of energy in is clearly not sustainable. All farms must therefore become powerhouses of renewable (solar) energy, investing as fast as can practically be arranged in on-site energy schemes such as wind turbines, solar thermal, PV, micro-hydro, biogas digesters, biomass boilers and so on. It's ludicrous that the Government does not have a comprehensive grant or loan scheme to make this happen right now. To a lesser extent, farm biofuel production might also become part of the overall picture, but only where it can comply with the strictest sustainability standards. Beyond that, farmers are going to have to come to terms with the fact that, in future, nitrogen will be fixed not by fossil fuels (in other words stored solar energy), but by real-time solar energy, converted by legumes (particularly clover) into bio-available nitrogen. In other words, soil fertility will again be solarpowered - surely the most important solar opportunity of all. In short, while the nation doesn't need to become self-sufficient in food, farms will certainly need to become self-sufficient in terms of energy - and indeed capable of producing surplus energy for surrounding communities. The next principle is RELOCALISATION. Whichever way you cut it, a combination of high oil prices, high input prices, growing demand for food, an additional 70 million or so people every year, and growing pressure on soil, water and biodiversity, all compounded by accelerating climate change and the kind of high carbon prices that are inevitably on their way, leads to only one rational conclusion: increased resilience by reducing the length (and vulnerability) of our supply chains. The more high quality, healthy food we can produce close to the point of consumption, the more resilient our food supply chains are going to be. That's not an expression of some anti-globalisation extremism: it's just common sense. The trends I have referred to earlier are not just foreseeable: they are inevitable. So why not get good at working with them rather than dying on the barricades of some superannuated ideology that sees global as good and local as bad? Some pragmatism here would be so welcome! Apart from an eloquent minority of post-oil fundamentalists, no one advocates doing away with the global food trade altogether. But we do need to become progressively less dependent on that trade, especially when we are able to grow much of what we need ourselves. Either here in the UK, or at least in Europe. And the final principle is REVITALIZATION. Prioritising local food production will help revitalize local economies. For me, this was always the strongest aspect of the Curry Commission's ground-breaking report. And although progress has been made in reconnecting producers and consumers over the last couple of years, an objective analyst would have to say that the Government's heart isn't really in that transition. There's no real support for local farmers' markets or Community-Supported Agriculture schemes. The thrice-launched Public Sector Food Procurement Initiative remains the dampest and most disappointing of damp squibs. A lot of the current regulatory controls seem purpose-built to thwart local producers rather than facilitate the contribution they could make to their local economies. And when one peels away the tired words both from Treasury or Number 10, it is literally impossible to detect any serious strategic intent on the part of this Government that this is the direction in which rural and agricultural policy must now travel. But many local communities are not waiting around to be given permission by central or even local government. As the Sustainable Development Commission's "Breakthroughs" project has just surfaced, there's a huge surge of interest in local food production going on across the country, from the Transition Towns initiative to specific schemes in places like Fife or Todmorden. It's rapidly becoming clear that one of the most important indicators of future success will be to reverse those wretched trends that we've seen over the last few decades with fewer and fewer people every year going into farming and food production: the simple reality is that ultra-low carbon farming and food production will simply require many more people. Once one understands the underlying principles on which any sustainable food and farming system needs to be organised, then the policy responses one comes forward with are likely to make rather more sense. In this case, unfortunately, a miserable combination of supranational shackles (applied, in the first instance, by a Common Agricultural Policy that is now demonstrably redundant and desperately damaging to farmers and consumers alike, and, at an even "higher" order of global entrapment, via the WTO), of ideological nostalgia that still lives on in the Treasury despite the near-total collapse of the Friedmanite neo-liberalism it has worked so hard to promote since the late 1980s, and an obstinate refusal to accept the laws of thermodynamics for what they are - laws, not optional accessories - that combination pretty much ensures that policy-makers in Defra and beyond steer clear of such underlying principles. Hence, in my mischievous opinion, the illuminating saga of David Miliband's whirlwind romance as Secretary of State in Defra with the concept of "One Planet Living" - and, by derivation, with ""One Planet Farming" - as in his eloquent speech to the Oxford Farming Conference in 2007. It was a great bit of rhetoric - and so much more buzzy and populist than dealing with dowdy old sustainable development! But once people started asking him to explain what he meant by One Planet Farming - in terms of fundamental planetary functions such as the nitrogen cycle, oil, soil, carbon, biodiversity, phosphates, water and so on - it was remarkable to see just how quickly OPF was consigned to that overflowing dustbin of "brave (but unfeasible) ideas". For it would indeed be brave if Defra was ever to do justice to the concept of One Planet Farming - and real food security - rather than persisting with the illusions of multi-planet farming as we do today. The NFU wouldn't like it. The major retailers wouldn't like it. Consumers probably wouldn't like it, for that matter, as it would undoubtedly entail the slaughter of a few sacred cows - such as the physical impossibility of meat consumption continuing at anything like current levels. The agri-biotech industry definitely wouldn't like it, as Defra would need to put them calmly back in their box and politely require them not to come out unless and until their GM solutions make some significant contributions to those underlying principles. Brave indeed, on that particular score, given that it currently seems to be "a condition of entry" that our Chief Scientific Advisors must do battle with "ignorant UK citizens" on behalf of GM industry before all other priorities. It really is time to get a sense of proportion here: GM may or may not have a contribution to make to a more sustainable world, but both the level of spin devoted to it and the political focus given to it are wholly out of kilter with the nature of the challenges we now face. "The UK Government should define food security in terms of genuinely sustainable food systems". Which builds the capabilities and skills necessary for future generations". For those who care about the future of farming in the UK, that final point is critical. Resilience, Resolarization, Relocalisation and Revitalization: how does anyone suppose, in Defra or anywhere else, that we can align policy against those fundamental principles without totally re-thinking research budgets (scandalously run down over the last decade or more, particularly on critical matters such soil science, low-input farming and so on), totally re-thinking our approach to skills and training, and totally re-thinking our approach to education. As the success of the 2008 Year of Food and Farming initiative has demonstrated, there is huge interest in schools and local communities in learning about food and farming, and in growing more of the food we eat. Food security is at least as dependent on getting it right in terms of research, skills and education as it is on re-thinking supply chains, input-output balances and so on. Which takes me back to the point where I started: accelerating climate change. This is not just one radical discontinuity amongst many: it is the ultimate discontinuity. Behind all the talk of "dangerous climate change", "abrupt climate change", "runaway climate change", and now, increasingly, the spectre of "irreversible climate change", lies a question that I suspect we hardly dare ask ourselves: how close are we, to that ultimate tipping point: the point at which humankind loses the ability to command its own destiny? We must all devoutly hope that such a tipping point is still so far away that we can avoid it altogether. That means, quite simply, radically decarbonising (or "resolarizing") food and farming must now become the driving force of UK policies. Despite its ready acceptance of the 2020 and 2050 targets, Defra still has no clear idea about what needs to happen in farming and food retail to make it possible to meet those targets. As soon as it does so, it will discover (not so surprisingly) that real food security and real sustainability are in fact one and the same thing.